I made the bed! See what I mean by simple? Well, simple for some, but in my true procrastinator fashion, not-so-simple. It was #14 on my Lovely List, and I put it there because I knew it would get me to do it. I mean after all, how could I let of all of you dedicated Cupcakes & Cat Food readers down? Right? 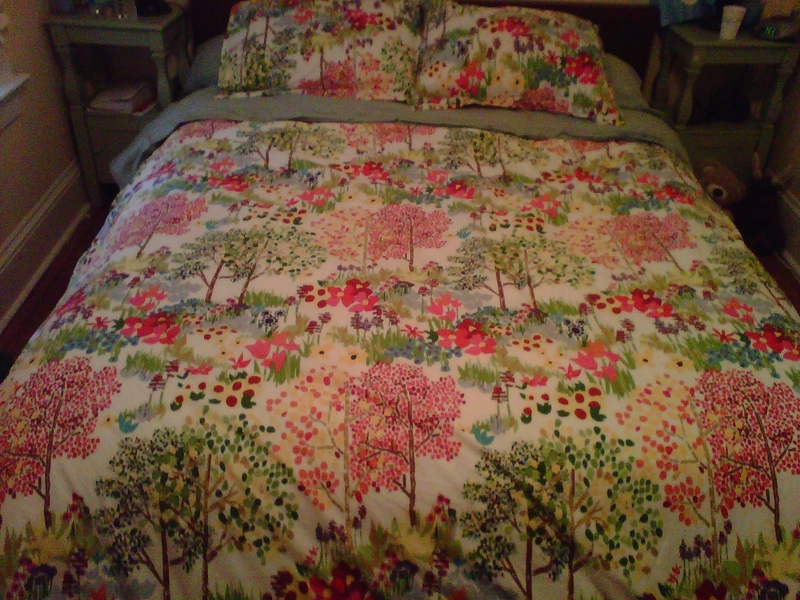 So I made the bed, and it is a lovely thing! Leaving the house with the bed made and coming home to it at night makes me simply happy. Now I just need to get myself to do it everyday. Tags: happiness, key to happiness, postaday2011, procrastinate, simple, Year of Lovely Things. Bookmark the permalink. Yay for a made bed! They really feel better to sleep in if they’ve been made up for a few hours. when i come home after work and i made the bed in the morning, it feels like a hotel room, makes such a difference! You’re so right – it really is the simple things – and it’s delightful to walk into the bedroom and see a clean, made bed. My bed…unfaithfully never made…..sniffle. I will try harder.